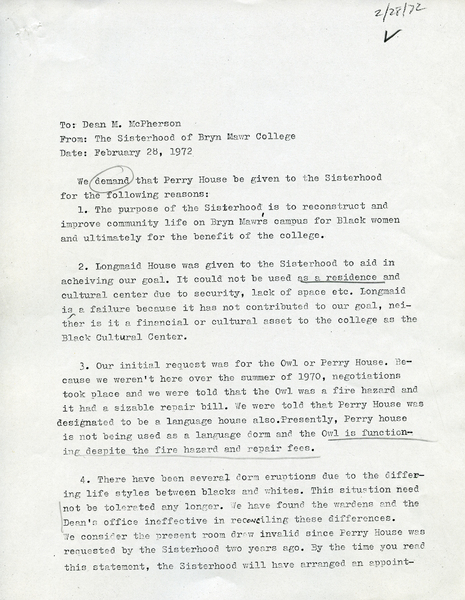 The document shown at left is a letter from the Sisterhood to Dean Mary Patterson McPherson in 1972, stating their demand that Perry House be converted into a residence for Black students, in service of the Sisterhood's goal as an organization to "reconstruct and improve community life on Bryn Mawr's campus for Black women and ultimately for the benefit of the college." 1. We demand the fourth appointment in Sociology as promised by September, 1970. This appointment should be a Black professor. 2. We demand the appointment of a Black professor in English and the reappointment of Mr. Herbert Aptheker in History. 3. We demand an appointment of a Black professor to fill other vacancies– Biology, Psychology, and Economics. 4. We demand an African American house. This house will be a cultural center, housing the Black Library, and a meeting place for business and social functions. We suggest the present Spanish House for this purpose. 5. We demand Bryn Mawr’s support in (facilities and faculty) a summer Pre-Enrollment program starting summer 1970. We also demand that Bryn Mawr should supply funds in the event that outside funds are not sufficient. 6. We demand that there will be a diligent effort to increase the Black enrollment and to provide funding for intensive recruitment program to find qualified applicants. 7. We demand that African languages and literature satisfy major requirements (language, literature, and/or major) and that transportation allowances be provided for these courses and other courses that have to be taken outside of the Bryn Mawr, Haverford, and Swarthmore community. We demand that these languages be introduced into the Bryn Mawr curriculum by September 1971. 8. We demand increased Black employment i.e. Black secretaries, librarians, bookshop clerks, etc. We want a progress report on May 1, 1970. 9. We demand the address of the maids and porters by respectful titles i.e. Mr., Mrs., Miss. We want this done by Administrative memorandum. 10. We demand the total revamping of the educational structure of Bryn Mawr College through student and faculty participation in college decisions."